[limited run in 2014 (Oct-Dec)] See, I was just trying to lure Nick into a false sense of security about our Turkey Hill competition. 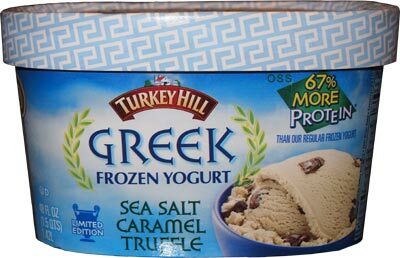 This limited edition container puts me at 6 vs 7 and I just need to find one random hidden container of Turkey Hill to rob him of his victory.... but at what cost? I take my first bite and surprisingly salt is the first thing that comes to mind. There is caramel flavor, but it's light and more of an afterthought. I don't think sweet is going to pop in your mind. Yes it's still a frozen treat but it's not like I'm getting a strong buttery vibe or anything. It sure looks like ice cream. 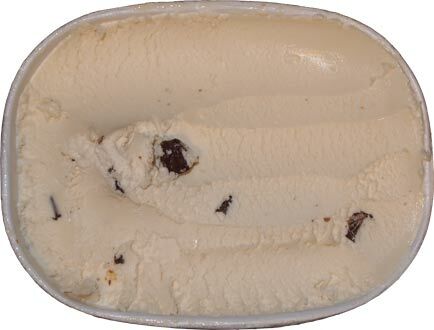 I think if you ate it quick enough, you probably wouldnt even notice it's not ice cream, at least not to start. There's a fair amount of density here and some creaminess. It's only when you really start to think about it that you start noticing a bit of gumminess to it. Nothing crazy, more a kin to how greek yogurt is denser than regular yogurt. Hmmm, I dont know what to make of this one. I mean, I seem to be enjoying my bowl, and despite the picture above, there are a fair amount of truffles to be had. I mean I'm looking at 4 of them clustered right in front of me, time for sampling! You know what? I think they have a bit of saltiness to them as well. When I'm done enjoying one, there does seem to be a bit of lingering saltiness on my taste buds. Hold on, I need to get a little more for my bowl... hehehe, I should probably add the disclaimer that despite tasting salt, this claims to be "low in sodium", just 5% per serving. 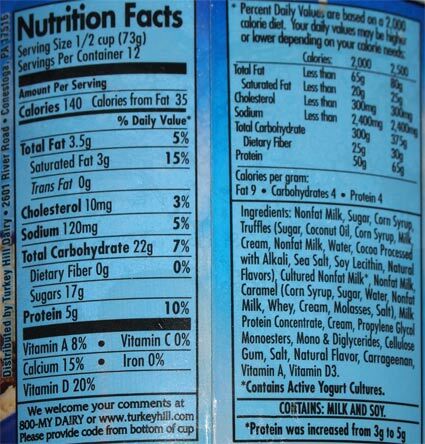 Yeah, at 5% that actually puts it as the highest sodium ice cream in the upstairs freezer. Uggg, semantics. At least I came across a bunch more truffles. Ok, I'm full.... and I know how to describe this. You know how different yogurt brands have different levels of flavoring? 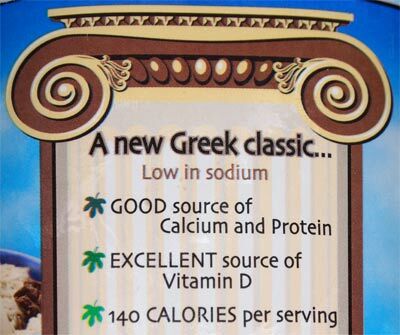 Well, that's like this greek froyo, it's like the brands that are light on the flavoring. I want to say that if a mildly flavored, kinda salty greek froyo interested you, go for it. 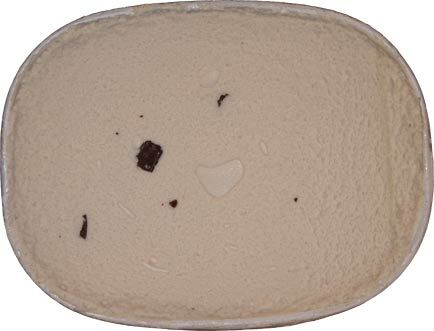 On Second Scoop: I kept thinking about this one after the first scooping, and I've since tried snacking on it two more times, and the reality is it bores me... or worse yet, it annoys me. I don't get why Turkey Hill cant make a stronger caramel flavor. Salty Caramel was a bore, though I was more tolerant with their All Natural Salted Caramel. I'm gonna say don't bother with this until they turn the salt down and the caramel up. Is this a new flavor by Turkey Hill? I tried this one. The pieces are interesting and enjoyable, and yes, actually a bit salty. But the base is horrible and hard as a rock, the vanilla flavor is week, and it could use a real caramel and hyper-sweet swirl. I wasn't a fan. Adam, I did try throwing on some caramel sundae syrup and the two just didnt mix well. I tried mixing in caramel apple oreos as well. Gonna try either biscoff spread or cookies (or both) since I'm desperate at this point to liven it up. I saw this at the grocery store today and was thinking about getting it. Good thing I didn't.